EBITDA is the figure commonly used to measure a company’s value and how well it performs against other businesses. 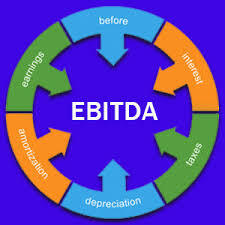 EBITDA stand for earnings before interest, tax, depreciation and amortisation and isn’t usually shown separately in formal financial statements. Usually its earnings before interest but after depreciation that’s shown in the formal Income statement. The reason EBITDA is commonly used as a measure is because depreciation and interest dilutes profit figures. This is due to companies ability to use differing asset lives for depreciation and different financing methods used to fund the company. A company with assets depreciated over a shorter period and with high levels of debt will have fewer profits than a company with longer asset lives and little debt. So EBITDA measures the actual cash the company generates before taking such expenses into account. This is why it is important and this figure expressed as a percentage of the company revenues, the EBITDA margin, can then be compared to its competitors and others. EBITDA is also used by analysts to compare earnings per share for listed companies. EBITDA is also used to value a company either for sale or for investors’ taking a share of it. The usual method is to take a multiple of historically achieved EBITDA, say 5 or 6 times depending on the industry sector, the economic climate and future earnings potential. Future earnings will be taken into account if EBITDA is expected to increase significantly in the short-term. The higher the perceived future earnings potential, the higher the EBITDA multiple. So when you come to sell your company or get investors’ on board, it is important to have a great track record of increasing EBITDA margins to maximise the value and also a good story on future earnings trends. This is what gets investors’ interested. After all they are on board for future profits. 4. Ensure your accounting records are up to date and monthly management accounts are produced with EBITDA margins highlighted. Are you following the above to maximise your company value? ← Off Balance Sheet financing – what does it mean? I recommended this to a few partners of mine to read. The key tips in this article are important to read. Personally, I think #4 is important so that the Margins are highlighted, for best practice. Thanks for your comment, Pat. Highlighting margins and discussing their fluctuation in regular internal accounts is very important.